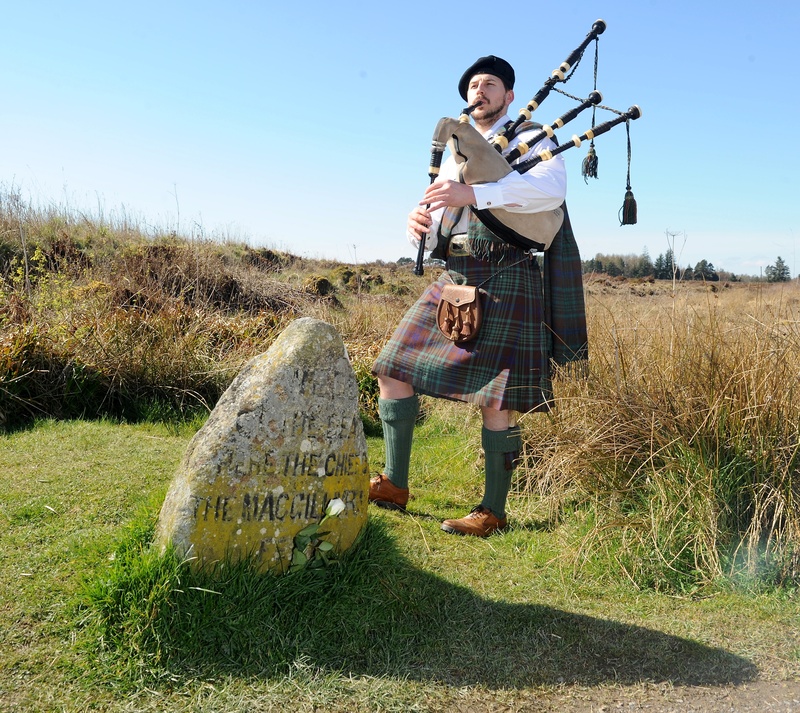 The annual commemorative service to mark the Battle of Culloden. 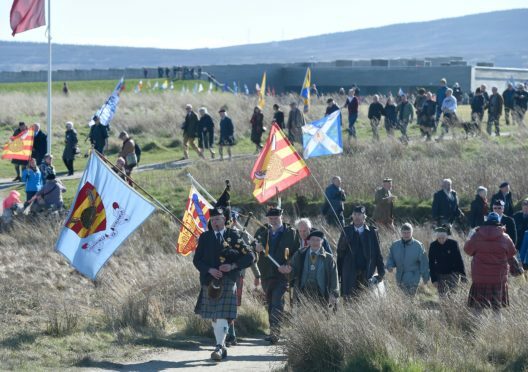 Flags and banners were raised over Culloden Moor at the weekend as hundreds came to pay their respects to those who fell on the battlefield. The last ever pitched battle to take place on British soil took place on April 16, 1746, effectively ended the Jacobite uprising and changed the course of British, European and colonial history for ever. 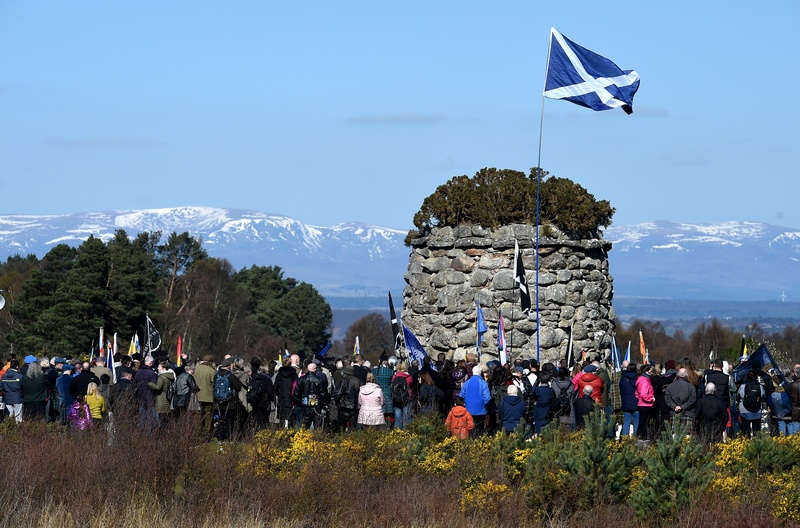 On Saturday, the traditional march to the Culloden cairn and anniversary service took place, led by the Gaelic Society of Inverness (GSI). Around 400 people wound their way to the cairn, many wearing period and modern kilts – tartan was banned in the wake of the battle – and bearing flags and banners proclaiming their clans and allegiances. Iain MacGillivray, Chief of Clan MacGillivray plays where a predecessor chief died during the battle. Campaigners from the Group to Stop Development at Culloden (GSDC) were present, with activist Carolyn Seggie laying a wreath at the cairn. She said: “It was a memorable day, very emotional and a tremendous honour to lay the wreath. The cairn was a sea of wreaths after the service, which included the singing of Gaelic psalms, a lament, a poetry reading, the GSI Chief’s address by Donald Martin, opening and closing remarks by chairman Murdo Campbell and a benediction by the Rev Canon Melvin Langille. Jacobite supporters from North America, Europe and Australia were to be found in the crowds. They continued their gathering at a musical evening in the Raigmore Motel. Clan Mackinnon members from the US, England, Germany and Scotland joined many other clans gathering for the anniversary. The clan’s commissioner for Scotland, Kevin MacKinnon said: “There was a very large crowd from all over the world to remember the men who fell on both sides of the battle. Over the weekend, Culloden managers, the National Trust for Scotland hosted a wide range of walks, talks and trails, some in partnership with High Life Highland. People gather at the cairn for the remembrance service. Dr Helen Wyld from National Museum Scotland, was joined by Dr Lucinda Lax from the Scottish National Portrait Gallery and Dr Arran Johnston in giving talks exploring aspects of the life of Charles Edward Stuart, while the NTS volunteer team gave a talk on the fates of the Jacobites involved in the battle. Out on the moor itself, NTS staff held tours of the battlefield, taking visitors through the action minute-by-minute, and revealing the real stories behind the battle. A family nature trail explored the animals and insects found on the moor.